Getting high at a wedding isn't exactly new, I remember sitting in on a session or two on my wedding day but for some people, getting high means first finding a discreet spot away from certain friends and family members. If you want to incorporate cannabis into your wedding day but aren't quite sure how to do so, read on for some inspiration. One of the easiest and most creative ways to include your favourite flower is to add elements of cannabis to your bridal bouquets or boutonnieres. You can be as subtle or as showy as you like and show off the range of colours present in fan leaves or even buds. Don't worry if floral design isn't your thing, there are florists out there who will work with cananbis - you may just need to provide it yourself. Why not go all out and set up a cannabis bar? You could offer dabs or jars of flower with beautiful glass pipes or even customized wedding day papers and matches. Hire a budtender to help ensure your guests enjoy responsibly and maybe even learn something new too. A good budtender can educate and entertain while serving your loved ones. Plus it adds an element of professionalism that grandma might appreciate. Consider setting the cannabis bar sightly apart from the dance floor. If your whole guest list is down to get high then disregard this suggestion but if like many of us, you have some family members who are not quite onboard the weed train why not set the dab bar back a bit so that guests who don't want to partake aren't offended by the smell and those who do don't feel like they're being watched. When Dani Geen and Zak Walton tied the knot they involved cannabis in their big day in a big way. Geen, an activist and concentrate expert who works alongside Steve D'Angelo at Harbourside and her husband are both dedicated medical cannabis users who incorporated their love of the plant into their day of love. 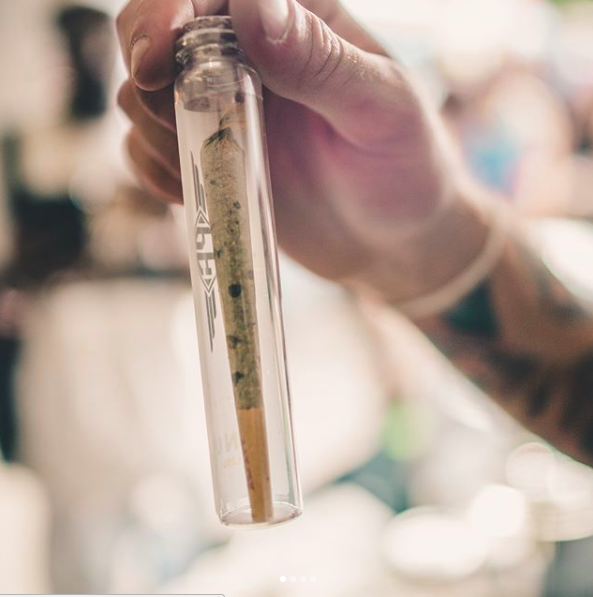 They included cannabis in their wedding in many ways - as detailed here by Forbes but possibly most notably by finishing the ceremony with his and hers dabs. Wedding favours are an opportunity to not only thank your guests for sharing your special day but to leave them with a memento as well. I'm loving the idea of customized doob tubes with prerolls inside. You can encourage your guests to toast with a toke or to enjoy at their leisure. Infusions are a great way to introduce the concept of cannabis consumption to relatives who may not be so comfortable with seeing and smelling clouds of fragrant smoke, just be careful to clearly mark the menu items that have THC in the ingredient list. We have a couple of cannabis-infused "mocktail" recipes that you can check out here, personally, I'm a fan of the Juicy Julep.